The Strada collection is delicate and ethereal. Each sculptural piece, with a seemingly random array of radiating quills, plays with cast shadow to evoke a soft sophistication. Available in Aged Iron, Burnished Silver Leaf, Gild, and Polished Nickel. The abstract and bold Cubist collection plays upon negative space and Kelly’s affinity for modernist art. These three-dimensional geometric sculptures utilize the interplay between light and shadow with a distinctive, spirited voice. Available in Aged Iron, and Gild. With its cantilevered profile and clean modern lines, the Studio Dining Chair celebrates purity in form and function. 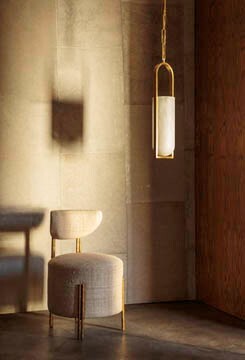 This dining or occasional chair features solid brass bar-stock in a Burnished Brass or Oil Rubbed Brass finish. The seat and backrest are available in a selection of curated fabrics and leathers.